ABBEYFEALE ON LINE! : ALIENS OVER ABBEYFEALE! Reports of UFO’s spotted along the Kerry coast this week have been treated with a certain amount of scepticism by the general public. However, unidentified flying objections have been observed in the skies over Abbeyfeale Hill for generations, and not all of these sightings were due to drink. Paddy John Batt is a prime example. He was returning home from town late one Saturday night, back in the sixties, when he claimed to have a close encounter with extra terrestrials or “little green men” as Paddy described them. He had sampled a few bottles of stout in Johnny Joy’s and was chugging slowly up the Hill Road in his trusty Morris Minor. He reached the top of the hill and turned right at O’Brien’s, only to be forced into an emergency stop and screeching halt by a large metal contraption parked in the middle of the road. It was a big, round yoke, Paddy later recalled, with windows in the sides and aerials sticking out of the top. But, more amazingly, hordes of little green men scrambled all over this strange gadget with screwdrivers and spanners, chattering and shouting excitedly to each other in some weird language. Paddy got out of his car and approached the mayhem. “Are ye alright there, lads?” he asked. It was nice to be neighbourly. One of the little green men, presumably their captain, walked slowly towards Paddy with an arm held aloft. The rest of the little green men had ceased their noisy antics at this stage and watched intently as Paddy came closer and examined their machine. He wondering if it was petrol or diesel. “Is this one of those flying saucer things?” he enquired. “And have ye come far?” Paddy wanted to know. “Ah, Knocknagoshel.” said Paddy. “I know it well. Plenty parking there. And where might ye be heading for?” he went on. Paddy took out the jump-leads and connected the Morris Minor to the flying saucer. “Try her now.” he said. The alien turned the starter and the motor stuttered briefly before suddenly bursting in to life, sending a pall of smoke from the exhaust. 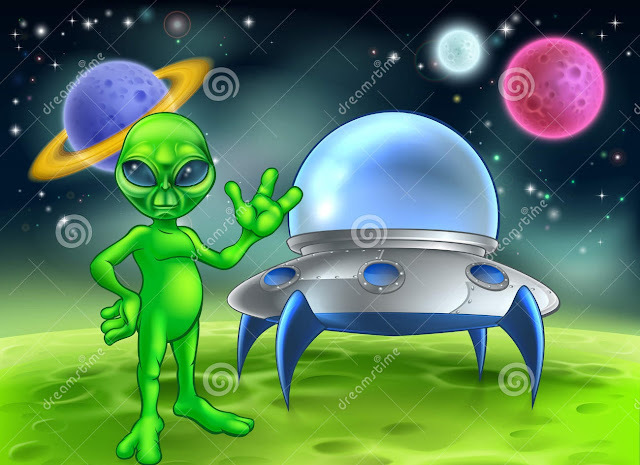 The little green men gave a loud cheer before clambering aboard the flying saucer and taking up their various positions. The alien shook Paddy’s hand and thanked him profusely. “Would you like a quick spin as far as the moon before we leave?” he asked. The alien closed down the hatch and the flying saucer rose slowly in to the sky with the little green men smiling broadly out the windows and waving their goodbyes. It did one final victory roll and then swept away in the direction of Mount Brandon. Paddy sat back in to the Morris Minor and turned on the ignition before suddenly realizing that something was missing. He jumped out and shook an angry fist up at the star-studded sky.